Yesterday felt like one of the coldest days of the year! No joke. Walking outside for 10 seconds made my legs feel like they were on fire! Then they went numb and I couldn't feel them. Ridiculous. And just my luck, my button fell off my jacket as I was walking from one class to another, so I couldn't button my peacoat up! It was so cold walking about with my arms wrapped around my body, looking like I was stealing something! Haha. Even better. Right when I got off class, my mother called me, and was freaking out because her car wouldn't start! Being the good child that I am, I decided to meet up with her and wait it out in the cold winter weather, until the guy from AMA arrived. After what seemed like forever, we headed home, and my mom started freaking out again! It was supposed to be my birthday dinner with my aunties that night, but because she didn't get home at 2pm like usual (we got home at 5..) she had no time to prep or cook the meal she had planned for the night. As a result, I suggested going out for hot pot (my fave!) at this place I recently saw an ad for in the local Chinese newspaper, called 649 Restaurant. They advertised all you can eat for $16.99 per person, which is very cheap compared to other placers in the city that charge $21.95 and up. We battled the quiet roads and slippery conditions until we reached a little strip mall in the Ermineskin/Steinhauer area in the south. 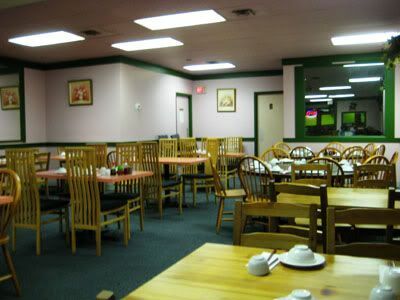 The restaurant looked empty, and although a little hesitant, we walked inside to be greeted by a very friendly Chinese lady. There was only one other table occupied in the dining area, and I'm not going to lie, it had me a little worried. 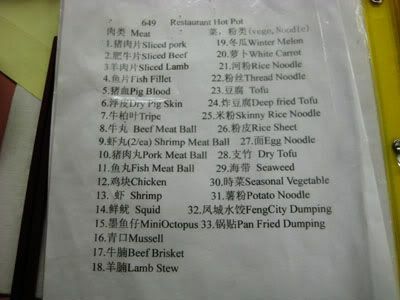 The Hot Pot menu consisted of 33 different items, some already cooked, and others waiting to be cooked in the broth. 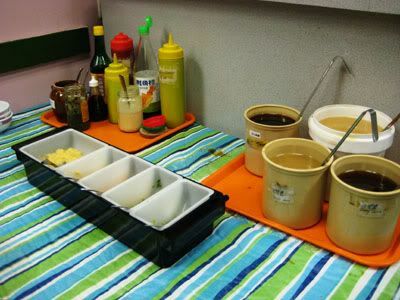 Despite the lack of variety, they carried the essential items that you could expect to eat at hot pot. One thing I like about this place is that you can order any type of broth that they carry at no extra charge, unlike King's Noodle & Hot Pot which charges $7 for flavours other than satay & chicken. 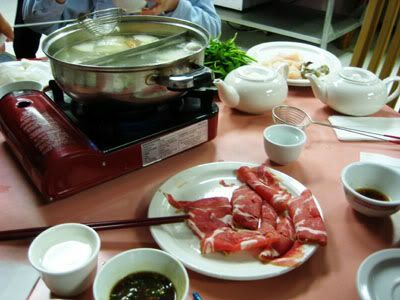 In addition, they provide patrons with a multitude of ingredients to create the perfect sauce for hot pot. Sauce is important! Tons of sauce making ingredients! After dining here, I heard complaints from some of my friends saying that this place was terrible. But in all honesty, I thought this place was great for the price! At $16.99, there is a trade off of price for variety, but the quality of the food and ingredients is fantastic. 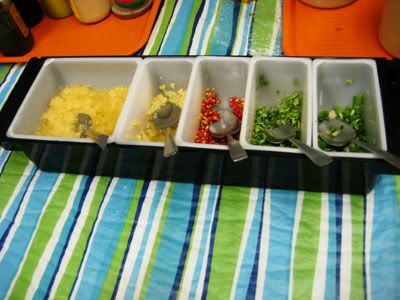 The vegetables are fresh, and the meat is sliced and prepared upon ordering. For a 10 minute drive away from my house, I appreciate that I don't have to drive 20+ minutes to go to Chinatown and have hot pot. Of course, if you're a fan of variety, I'm sure you wouldn't mind paying the $5 extra to go to Chinatown.